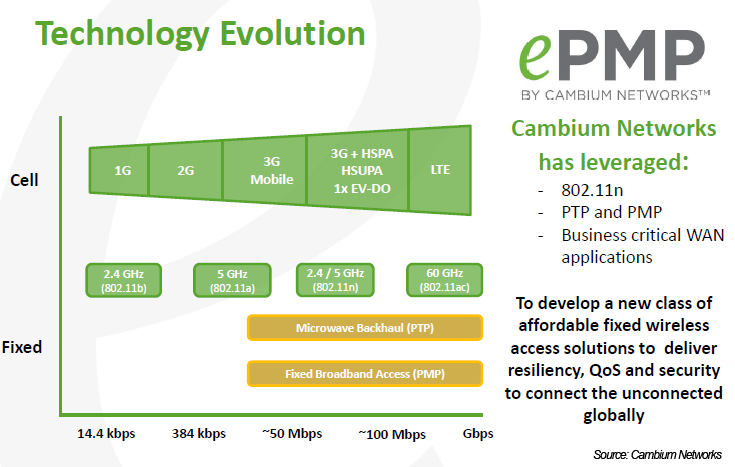 Cambium Networks unveiled its ePMP wireless access platform for connecting underserved and unconnected global communities. ePMP is a point-to-multipoint (PMP) fixed wireless access solution that operates in the 5GHz frequency band and can deliver over 200 Mbps throughput using 2x2 MIMO-OFDM technologies and 20/40 MHz channel bandwidth. Using sectored antennas, ePMP can cover a range of up to 21km. Up to 120 units can be configured for point-to-multipoint. Cambium employs intelligent bandwidth algorithms to direct the bandwidth where it’s needed and GPS synchronization for frequency use without interference. The GPS synchronization significantly improves UDP/TCP performance. The system uses a commercial 802.11n system on a chip (SoC) that has been modified to create a deterministic TDMA system. Cambium has also employed a modified, high performance and noise resistant MAC and PHY. The design also features surge protection against lightning strikes. Compared to Google's Project Loon or Facebook's Internet.org initiative, Cambium said its 5 GHz point-to-multipoint radio is a practical solution for extending broadband to rural or municipal locations. It could also be deployed in point-to-point configurations for enterprise LAN extension links, or for video surveillance backhaul. Subscriber modules are estimated to cost under US$100. 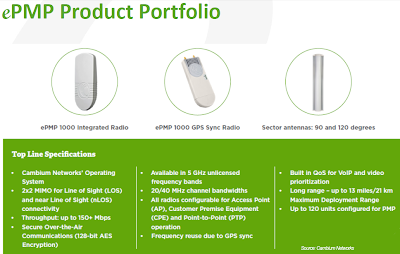 GPS Synchronization for Scalability and Quality of Service (QoS) – GPS sync provides the scalability and reliability service providers need to expand their networks, enabling them to take advantage of growth opportunities and create sustainable business models. ePMP is able to handle up to 120 subscribers per unit without service degradation due in part to the spectral efficiency achieved through GPS sync. Prioritization for Quality of Service (QoS) - ePMP provides superior QoS with three levels of support for VoIP, high-speed data and video applications. The auto VoIP feature on the GUI enables automatic voice prioritization, delivering clear and uninterrupted audio. Prioritization ensures maximum performance, consistently delivering high data quality and guarding against garbled speech and choppy video transmissions. Robust Security – ePMP assures integrity of critical information transmitted over the network with 128-bit AES encryption and L2 and L3 firewall settings. Durability, Ease of Deployment and Maintenance - With a decade of experience in outdoor installation, Cambium Networks’ hardware is designed to ensure consistently high performance and resiliency in the outdoor environment regardless of temperature, humidity or altitude, and requires few tools to install. Its GUI is intuitive with real-time dashboard support, and companies can also use call center support with toll-free or local telephone access in 22 countries. 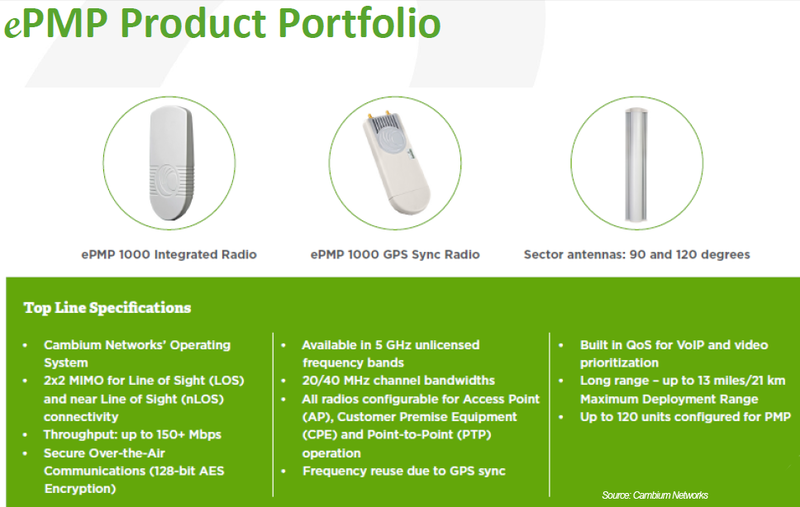 The company is introducing two ePMP modules: the ePMP 1000 Integrated Radio and the ePMP 1000 GPS Sync Radio. Both can be configured in GPS synchronized networks as synchronization is a necessity in any environment, regardless of spectral competition. Cambium Networks was previously Motorola Solutions' Point-to-Point (PTP or Orthogon) and Point-to-Multipoint (PMP or Canopy) Wireless Broadband Networks division. The company spun-out in 2011 as an independent company owned by Vector Capital. The company is based in Rolling Meadows, Illinois. In February 2013, Cambium Networks named Atul Bhatnagar as President & CEO. He previously served as President and CEO of Ixia, and, before that, as VP & GM of Nortel's Enterprise Data Networks group. 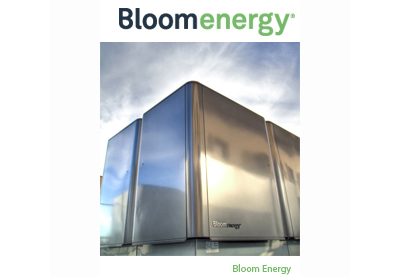 CenturyLink will install Bloom Energy fuel cells to generate up to 500 kilowatts of clean, reliable power for one of its California data centers. The fuel cells, expected to produce nearly 4.4 million kilowatt-hours of annual electricity, will help power cloud, managed hosting and colocation services housed within the data center, located in Irvine, California, and operated by Savvis, a CenturyLink company. The Bloom system will be fully operational in early to mid-2014. Zayo Group has acquired FiberLink, which operates a 1,200-mile route fiber network running between downtown Chicago through Des Moines and Omaha to downtown Denver. 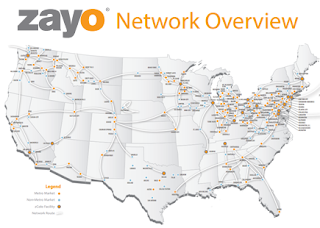 With this acquisition, Zayo now offers approximately 26,000 routes miles of dark fiber with associated colocation and technical support services. Financial terms were not disclosed but Zayo said that, in conjunction with the transaction, it drew funds from its previously undrawn $250 million revolving credit facility. Level 3 Communications launched a new SIP-based (session initiation protocol) platform that enables enterprises to securely connect more sites with greater operating and cost efficiency, incorporating a fully native PRI (primary rate interface)-handoff capability and other new performance-enhancing features. Level 3 said its Voice Complete solution achieves higher overall efficiency and savings when compared to existing service offerings by including built-in options for disaster recovery, emergency 911 and the ability to connect legacy TDM office sites more easily without the need for equipment upgrades. A fully native PRI-handoff option, allowing customers to receive a SIP handoff directly to a TDM (time division multiplexing) private branch exchange (PBX) without the need to purchase or configure additional equipment. Geographically independent telephone numbers, simplifying the management of telephone numbers across mobile workforces and providing virtual presence. A combination of dedicated long distance and local services, SIP services and ISDN-PRI (integrated services digital network) services. 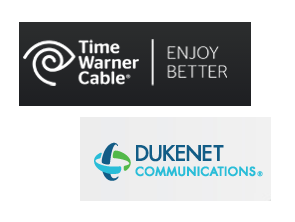 Time Warner Cable has agreed to acquire DukeNet Communications for $600 million in cash, including the repayment of debt. DukeNet Communications, which is a subsidiary of Duke Energy Corporation, operates a regional fiber optic network company serving customers in North Carolina and South Carolina, as well as five other states in the Southeast. Its fiber network spans over 8,700 miles and provides high-capacity services to wireless carrier, data center, government, and enterprise customers. Duke Energy owns 50 percent of DukeNet. The Alinda investment funds own the remaining 50 percent. "Business Services is a key growth area for Time Warner Cable and this acquisition will greatly enhance our already growing fiber network to better serve customers, particularly those in key markets in the Carolinas," said Phil Meeks, Executive Vice President and COO of Business Services for Time Warner Cable. "This acquisition will help us expand our fiber footprint at a price that is consistent with our disciplined approach to M&A, accounting for expected synergies and tax benefits." Altera is collaborating with China Mobile Research Institute (CMRI) on its Centralized Radio Access Network (C-RAN) architecture. The cloud-based C-RAN architecture aims to use cloud technology to centralize the baseband processing across a large-scale area. China Mobile is actively developing the C-RAN architecture in order to cost-effectively optimize its network based on various wireless standards including GSM (2G), TD-SCDMA (3G) and LTE (4G). 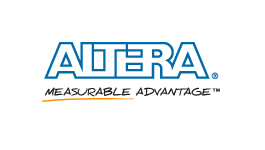 Altera announced that its FPGAs and intellectual property (IP) are being used as a development platform. Altera is also providing technical support to verify future wireless architectures used in the cellular network of China Mobile. “A C-RAN architecture addresses many of the challenges that carriers like China Mobile must deal with in this mobile internet era,” said Scott Bibaud,senior vice president and general manager of Altera’s Communications and Broadcast Division. 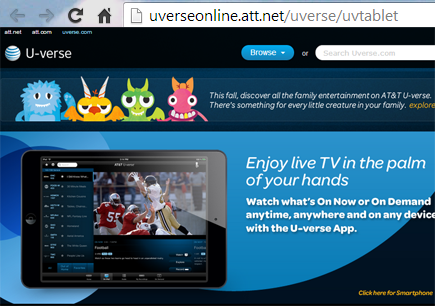 AT&T launched more than 100 live channels on its U-verse App for smartphone and tablets. However, due to restricted broadcast rights, the mobile app, which is available only for customers of the residential AT&T U-verse TV service, currently allows about 20 of the channels to be watched outside the home. AT&T said it will be adding more live channels and expanding the live channels to more devices on an ongoing basis. "By making live TV content available across devices we're enabling our customers to watch TV on their terms when and where they want it," said Mel Coker, Chief Marketing Officer, AT&T Home Solutions. "U-verse has always been about delivering a TV experience built around our customers, and this enhancement gives them even more flexibility and control." In addition to live channels, the U-verse App also offers remote control features, a channel guide, thousands of on-demand shows, extra content about the programming, and advanced search. HickoryTech, which serves the upper mid-West with fiber network spanning more than 4,100 route miles, changed its name to Enventis. HickoryTech currently operates under the Enventis brand in the Twin Cities, northern Minnesota, Rochester, Minn., Fargo, North Dakota and Des Moines, Iowa areas where the company has offices and local employees. This announcement extends the Enventis brand to the company’s operations in southern Minnesota and northwest Iowa where the company provides residential and business communication solutions in 34 communities. The London Internet Exchange (LINX) has chosen CoreSite's Northern Virginia data center campus as one of the locations for its first North American peering exchange, LINX NoVA. LINX, one of the world's largest Internet exchanges, recently announced plans to bring it distributed peering model to North America. "We are delighted to be expanding into North America," said John Souter, CEO at LINX. "We believe that our deployment in CoreSite's Northern Virginia campus will contribute to us being able to create a successful new exchange in the US. To demonstrate our commitment to building a world leading Internet Exchange in North America we will be subsidizing it by providing free 10G ports to any networks who join." In addition to being able to peer in the Northern Virginia area at LINX NoVA, CoreSite's Open Internet Exchange Hub currently provides direct connections to multiple exchanges including remote access to peering in Europe at the London Internet Exchange (LINX), Amsterdam Internet Exchange (AMS-IX), German Commercial Internet Exchange (DE-CIX), and peering elsewhere in the US with New York International Internet Exchange (NYIIX) and CoreSite's Any2 Internet Exchange. "The addition of LINX NoVA to our group of peering partners will further enhance the existing network density inherent in CoreSite's Northern Virginia community and support the development of a more robust Internet peering ecosystem in the important Northern Virginia market," said Brian Warren, VP Product Management at CoreSite. "As reflected by the introduction of our Open Internet Exchange Hub last year, we believe in the importance of neutral Internet exchanges and our relationship with LINX NoVA in Virginia further strengthens our platform’s value in providing our customers additional opportunities for both connectivity and community." In August, The London Internet Exchange (LINX) announced plans to establish a new, neutral, multi-site Internet Exchange in EvoSwitch's new WDC1 data center in Manassas, Virginia. The Exchange, called LINX USA, will be run by LINX and be closely modeled after their Exchange in London, currently one of the largest exchanges for Internet traffic worldwide. EvoSwitch's WDC1 data center in northern Virginia is the first of three data centers in the region to reach an agreement with LINX for its initial footprint as a multi-site Internet Exchange (IXP). Stream Data Centers will build a state-of-the-art, 75,840-square-foot data center in San Antonio, Texas. The greenfield facility will deliver 7.2 MW of critical-load power. It will include dual-feed power from two separate substations, and Stream will utilize its standard 2N electrical / N+1 mechanical configuration for the project. 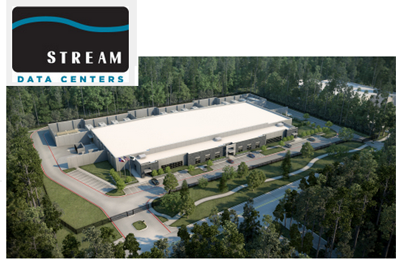 Stream plans to divide the data center into three 10,000-square-foot PDC Suites, which can be further divided in 200 KW increments to meet multiple size requirements in the market. The facility will also feature redundant telecommunication rooms with access to the multiple fiber providers serving the site. Each suite will also provide 4,500 square feet of private, dedicated office space for disaster recovery. The Stream PDC in San Antonio will be fully commissioned and ready for occupancy in May 2014. The company also has data center facilities in Dallas, Denver, Houston and Minneapolis.